Francis Lovell, 9th Baron Lovell, 6th Baron Holand, later 1st Viscount Lovell KG (1456 – probably 1487) was an English nobleman who was an ally of King Richard III during the War of the Roses. Sir William Catesby, Sir Richard Ratcliffe and he were among Richard's closest supporters, famously called "the Cat, the Rat and Lovell our dog" in an anti-Ricardian squib. In addition to being an ally, Lovell is attributed as Richard's best friend. Lovell continued the Yorkist resistance into the early years of Henry VII's reign, but his fate is unknown after he disappeared following the final defeat of the Yorkists at the Battle of Stoke Field in 1487. Francis was the son of John Lovell, 8th Baron Lovell and Joan Beaumont, daughter of John Beaumont, 1st Viscount Beaumont. When his father died, the probably eight-year-old  Francis inherited the titles of Baron Lovell and Baron Holand. He became a ward of Edward IV of England, who gave him into the charge of Richard Neville, 16th Earl of Warwick, where Edward's youngest brother Richard, Duke of Gloucester also spent some time. It may have been there that the two young men first formed their close association. By 1466, he was married to Anne FitzHugh, daughter of Henry FitzHugh, 5th Baron FitzHugh. FitzHugh had married the Earl of Warwick's sister Alice Neville and supported Warwick's rebellion against Edward IV in 1470. As the pardon issued to Henry, Lord FitzHugh includes Francis Lovell it can be assumed that Francis lived with his father-in-law at this time. When Edward IV had re-established his rule in 1471, he granted the wardship of Francis Lovell, who was still underage, to his sister Elizabeth and her husband John de la Pole, 2nd Duke of Suffolk. Upon the death of his paternal grandmother Alice Deincourt in 1474 he inherited a large estate, including the lands of the baronies of Deincourt, Grey of Rotherfield, and the feudal barony of Bedale. He was now one of the wealthiest barons in England not holding an Earldom or Dukedom. Lovell became a follower of his friend, Richard, Duke of Gloucester, to whom he was also linked through their respective marriages: his wife, Anne FitzHugh was the first cousin of Richard's wife Anne Neville. Lovell served under Richard in the expedition to Scotland in 1481, and was knighted by Richard for it, the same year. After the death of Edward IV on 9 April 1483 he became one of his patron's strongest supporters, though he seems not to have taken an active political part in the proceedings at that time. He had been created a viscount on 4 January 1483, and while still Lord Protector Richard made him Chief Butler and constable of Wallingford Castle. Richard acceded to the throne on 26 June 1483; at his coronation on 6 July 1483, Francis Lovell bore the third sword of state. 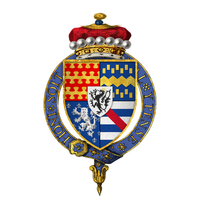 Lovell was promoted to the office of Lord Chamberlain, replacing the late William Hastings, and was made a Knight of the Garter in 1483. Lovell helped in the suppression of Henry Stafford, 2nd Duke of Buckingham's rebellion (1483). The poem was interpolated into Laurence Olivier's film Richard III, a screen adaptation of William Shakespeare's play. In June 1485, Lovell was appointed to guard the south coast to prevent the landing of Henry Tudor. However, Henry Tudor landed in Wales near Milford Haven avoiding the stronger defences of the English south coast. While no chronicle account of the battle mentions Lovell, it seems certain that he fought for Richard at the Battle of Bosworth Field (22 August 1485). Two reports written in the immediate aftermath of the battle list him as among the fallen. In fact, he escaped. After the battle, Lovell fled to sanctuary at Colchester and from there escaped the following year to organise a revolt in Yorkshire that attempted to seize Henry VII. After the failure of this plot, Lovell tried seizing Henry VII in York by himself, and is believed to have been behind an attempted assassination of Henry in York. After the failure of both these attempts, then first joined fellow rebels at Furness Falls and later fled to Margaret of York in Flanders. As a chief leader of the Yorkist party, Lovell took a prominent part in Lambert Simnel's enterprise. With John de la Pole, Earl of Lincoln, he accompanied the pretender to Ireland and fought for him at the Battle of Stoke Field on 16 June 1487. He was seen escaping from the battle and may have eventually fled to Scotland, where on 19 June 1488 James IV issued a safe conduct to him. There is, however, no indication he ever arrived or lived in Scotland, and no further information about Lovell's fate. Francis Lovell's wife, Anne Fitzhugh, was granted an annuity of £20 in 1489. She was still alive in 1495; the date of her death is not known. Plaque to Francis Lovell at Mottram in Longendale. Francis Bacon relates that according to one report he lived long after in a cave or vault (History of Henry VII, p. 37, ed. Joseph Rawson Lumby). More than 200 years later, in 1708, the skeleton of a man was found in a secret chamber in the family mansion at Minster Lovell in Oxfordshire and it was supposed that Lovell had hidden himself there and died of starvation. While this story is very picturesque, it seems unlikely to be true. Francis Lovell had hardly spent any time at Minster Lovell and would not have a faithful servant there who would hide him for years. Additionally, the manor had been granted to Jasper Tudor, Duke of Bedford, Henry Tudor's uncle, and was therefore hardly an appropriate hiding place for Francis Lovell. The third slab, an alabaster one, lies at the south end of the altar-table. A few lines in black wax constitute the remains of an inscription and effigy of a knight of the 15th century. The late Mr. Lawson Lowe, of Chepstow, said in December, 1882, that when he visited the church in 1865, the date could be made out, and he thought the effigy might be that of a knight who fought at the battle of Stoke, near Newark, in 1487. Gedling Church and Stoke Bardolph Castle, the ancestral home of Joan Bardolph who was Francis's great-grandmother, lie just a few miles away from the battlefield of Stoke. It is feasible that Francis attempted to escape across the river at the Fiskerton shallows but was either killed or died later of his wounds, his body being buried under the flagstones in the Gedling Church in order to prevent the certain fate of them being 'hung, drawn and quartered'. This article incorporates text from a publication now in the public domain: Chisholm, Hugh, ed. (1911). "Lovell, Francis Lovell" . Encyclopædia Britannica. 17 (11th ed.). Cambridge University Press. p. 71. Archbold, W.A.J. (1893). "Francis Lovell, Viscount Lovell (1454-1487?)". Dictionary of National Biography. 34: 172–173. Ross, Charles (1981). Richard III. ^ Calendar of Patent Rolls, 1467-1477, p. 51. ^ a b Ross, p. 49. ^ A.J. Pollard, "Lord FitzHugh’s Rising in 1470", BIHR 53 (1979), p. 170-71. ^ Calendar of Patent Rolls, 1467-1477, pp. 261, 312. ^ R. Horrox and P. Hammond (eds. ), British Library Manuscript. 433 (Gloucester, 1983), vol. iii, p. 3-4. ^ Anne F. Sutton and P.W. Hammond (eds. ), The Coronation of Richard III. The Extant Documents (Gloucester, 1983), p. 37. ^ Rosemary Horrox, Richard III, p. 249. ^ Complete Peerage, vol. ii, Appendix B. ^ Robert Fabyan, The New Chronicles of England and France in to Parts (London, 1811), p. 672. ^ M. Bennett, The Battle of Bosworth (Stroud, 1993), p. 155. ^ Roger Lockyer, Andrew Trush, "Henry VII"
^ J. Williams, 'The Political Career of Francis Viscount Lovell. 1456-? ', The Ricardian 8 (1990), pp. 393-94. ^ Joanna M. Williams, "The Political Career of Francis Viscount Lovell (1456-?)" ^ J.G. Gairdner (ed. ), Letters and Papers of the Reign of Richard III and Henry VII, RS 24 (London, 1861), vol. ii, p. 71. ^ J. Williams, p. 397. ^ For the discovery at Minster Lovell see Notes and Queries, 2nd series i. and 5th series x; F. Peck, Memoirs of Oliver Cromwell, p. 87, cited after A.J. Taylor, Minster Lovell Hall. Oxfordshire (English Heritage)(1958), p. 19. ^ Calendar of Patent Rolls, 1485-1494, p. 64. ^ Mr Richard Whitbread (1903). "Gedling church". Transactions of the Thoroton Society. nottshistory.org.uk. Retrieved 20 April 2018. Henry Bourchier, 5th Baron Bourchier, 2nd Count of Eu, 1st Viscount Bourchier, 1st Earl of Essex, KG, was the eldest son of William Bourchier, 1st Count of Eu and Anne of Gloucester. On his mother's side, he was a great-grandson of Edward III of England. Minster Lovell Hall is a ruin in Minster Lovell, an English village in the Oxfordshire Cotswolds. The ruins are situated by the River Windrush.